Its been exactly 6 months since I last blogged and I can't claim to have been so busy that I was unable to find time, I have actually been extremely busy but more so I reached a place in my life where I felt like less was more. We live in the TMI age where nothing is off limits, where camera's follow people around while they live their daily lives, where childbirth is broadcasted on national tv, where someone doesn't even need gps or whatever to track a person, just follow them on twitter and you can find out everything about a person. It just became a bit much and for a while I was living in the 1950's. Thankfully I copped on to myself and returned to 2010, realizing that bbm, twitter, facebook, cnectd, blogging etc are so much more than people just giving others voyeuristic inroads into their lives but have become an instant news source, it has created various ways with which to get in touch with a person *sidebar* (i love the scene in "he's just not that into you" where Drew Barrymore says, the days have passed where you could just call a guy and he wouldn't pick up, now he can ignore you, on email, pager, myspace, facebook). In this curent technological climate we can add bbm and twitter to the mix, so many ways of getting in touch with people, its mind boggling. Anyhoo, I'm not saying I'm gonna be blogging as constantly as before but I guess when I have something to say, spit on or spew about, I'll come on here instead of boring my friends to tears with my rants. Il est grand d'être de retour! 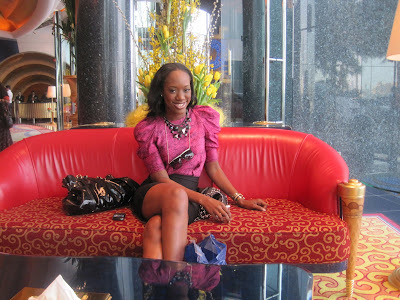 Y'all need to check out this blog, www.makywaky.blogspot.com, certified fabulousity! Welcome back! That was a long hiatus! ope o lol welcome back. Hmmm, who are you? !Great content in here....Stay a while. glad you're back babe. I didnt relocate to naija :( I'm now in Toronto. I wish I was in Lagos or Abuja though...so tired of this country. "...living in the 1950's." Wow!!! you really can't be serious. You don't sound that 'old'.